Return from the center of the earth. 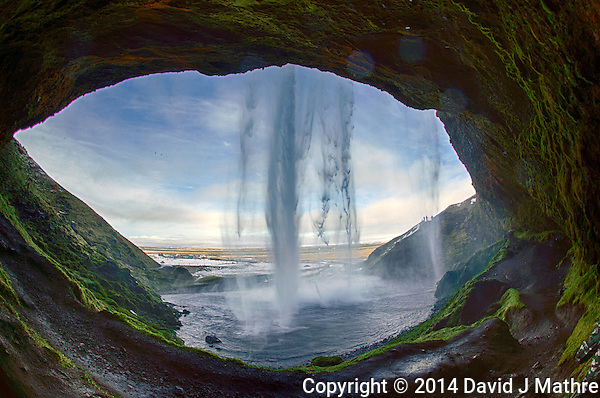 Fisheye view from behind Seljalandsfoss, a waterfall in southern Iceland. HDR composite of 3 images taken with a Nikon Df camera and 16 mm f/2.8 fisheye lens (ISO 100, 16 mm, f/10) using Capture One Pro and Google HDR Efex Pro 2. For the title, I like the B&W version better than the color one. There are also too many artifacts (purple fringing) in the color version. In either case, it was a difficult shot with the wide range of light, and the constant spray of water from the waterfall. The pathway to the back of the waterfall was covered with ice, and I was glad I had crampons for my boots. Whew — looks like you barely made it back! 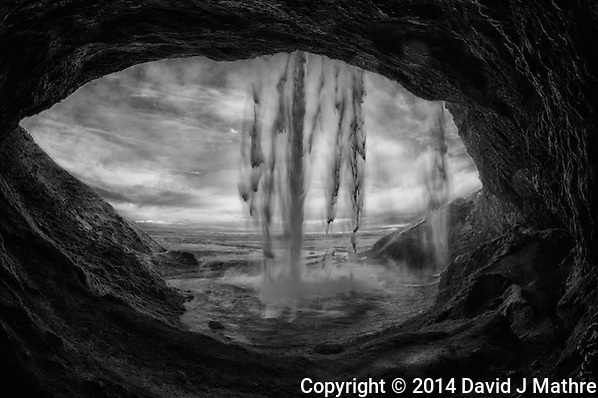 Fantastic visual using ost support algorithms David! Its good to get back up and out, did you find any aliens in the center?